Situated in the heart of Scunthorpe, North Lincolnshire, Queen Bee embraces bespoke Hair and Beauty treatments in the elegance of a uniquely styled boutique salon. Owned and run by Hayley Richardson and Jenny Blanchard the salon fuses over 40 years of first class experience with exceptionally well trained, competent therapists and stylists, ensuring clients receive service beyond their expectation. The salons exclusive design reflects an elegant charm with vintage style mirrors and French dressing tables, whilst epitomising the sensation of luxury and sophistication with a modern chic vibe. Accompanied by our warm and truly genuine client focused approach, Queen Bee endeavours to be the ultimate relaxation haven where the stress of day to day life can drift away, leaving you to enjoy industry leading products applied by skilled and ardent professionals.WE OFFER 20% DISCOUNT TO ALL NEW CLIENTS ON THEIR FIRST VISIT TO THE SALON, PLEASE QUOTE SALON SPY! A lovely, intimate place where the staff are wonderfully friendly. This is the first time I had been to this salon and I will definitely be returning. I had my hair cut and coloured, and I am beyond happy with the result. The stylist listened to what I wanted, suggested a few things and I could not be more impressed with how it has turned out. I also had my eyebrows done whilst I was there- another thing I am very pleased with. I absolutely love this place to the point where I can no longer enjoy spa treatments in day resorts because I constantly compare them to the quality and talent of Kylie, Beth and Hayley. Everything about it instantly chills me out, I quite frequently just turn up for a little moment of relaxation. The girls always always always make me feel welcome and special. Don't get me started on Katie- this girl, she knows hair. I have a mane!! But she has worked miracles on it, I've converted my Mum to her and my Husband. She's clear, precise and always does what is absolutely in your best interest. My mums hair looks better and better everytime!! I am for the first time excited to go to the Hairdresser!! If you'd like brassy tones, dried out hair, owners screaming at you for no logical reason then this is the place for you. Relaxation & pampering are not what you get here. Appalled! I have tried a lot of hair and beauty salons in the past and this is by far the best I have ever been to. The staff are lovely and welcoming, the decor is simply stunning and the results from both the beauty salon side and the hair salon side are completely fantastic. The products they use are second-to-none and this really shows in the amazing results they achieve. I recently had a facial and a cut and blowdry there and I have to say I would go back in a heartbeat. Would thoroughly recommend. Jenny has been doing my hair for about 18 years and she always does such a great job. I also went to Hayley's salon for my beauty treatments. Imagine how pleased I was when they went into business together and now I can have it all done in the one place. 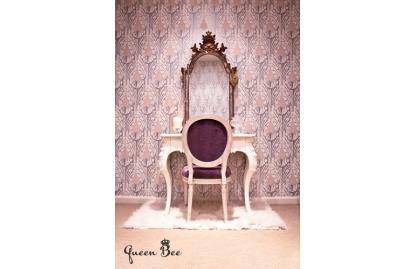 The staff at Queen Bee are always friendly and the standard of service that you receive is second to none. Nothing is ever too much trouble. My friends and work colleagues always comment on my hair after Jenny has done it. If you're going out you can book in and have your hair and nails done at the same time with their Bee Pampered package which is a treat. The salon is lovely and comfortable and I look forward to going for some peace and quiet and me time. If you have never been you really need to give it a try. Every aspect of the service received at Queen Bee is faultess! The warm welcome from all the staff puts you at ease the moment you walk into the beautifully decorated salon. Hairdresser Jenny has restored my faith in colourists, she managed to rectify a terrible colour job I'd had at another salon, with the result exceeding my expectations! I will continue to visit this salon, a few hours here feel like a little treat away from it all. I've been a customer of Queen Bee from the beginning. As well as having my normal beauty treatments I can have my hair done too in one great place. The ladies and newly recruited Lewis are fantastic, you feel like the only person in the world when you arrive unlike other salons. They have great products, I love Darphin and the bumble sumo tech is the best. You cannot get a better beauty treatment or hair cut in Scunthorpe and surrounding areas. Well worth a visit! I would thoroughly recommend this salon. The staff are really warm and welcoming. They listen to what you want and take the time to understand you and your daily routines in order to advise you on the best hair style. I really enjoyed the whole experience in being in the queen bee salon, I even stayed and had a beauty treatment in their spa!